A cargo boat carrying construction aggregate from Male’ City to F. Nilandhoo tipped to the side after taking in water, this Monday morning, throwing sacks of aggregate into the water. Maldives National Defense Force said report of the boat, Aim Cargo 1, taking in water was received by the Coastguard Maritime Rescue Coordination Center at approximately 4:50 am. The authority said the Coastguard is using a pump to expel the water. 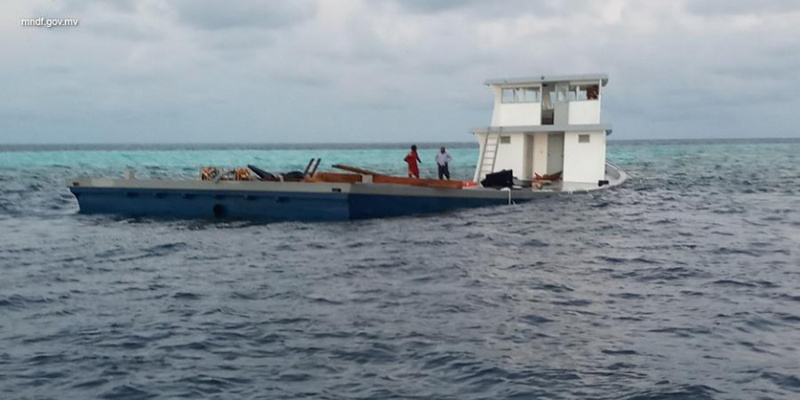 MNDF says Aim Cargo 1 was carrying 4,000 sacks of aggregate when it toppled. There were two expatriates and one Maldivian on board when the incident took place. According to MNDF, the captain of the boat says it started taking in water due to the heavy weight of the cargo it was carrying. The boat is now wrecked on a lagoon near Vaagali.